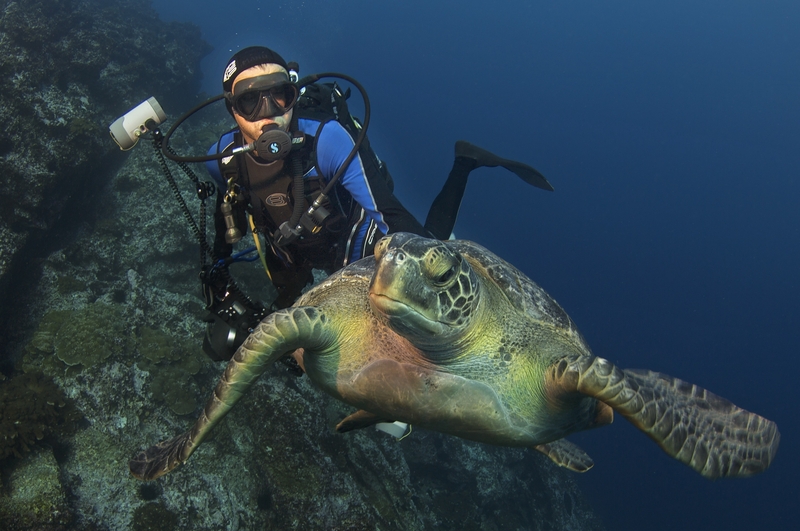 Enric Sala, diving with a green turtle off Cocos Island, Costa Rica. Sala leads National Geographic's Pristine Seas project, which aims to find, survey and help protect the last healthy and undisturbed places in the ocean. Photo by Octavio Aburto. The National Geographic Society named two new Explorers-in-Residence today. Enric Sala and James Cameron (yes, that James Cameron!) were appointed to this prestigious group of fifteen leaders and researchers across a range of fields including (my personal hero) Sylvia Earle and oceanography giant Robert Ballard. NGS hasn’t named a new Explorer-in-Residence since 2005, so this is quite the honor! Sala fell in love with the sea while growing up on the Mediterranean coast of Spain. After obtaining a Ph.D. in ecology in 1996 from the University of Aix-Marseille, France, he worked in California for 10 years as a professor at the prestigious Scripps Institution of Oceanography. In 2006 he moved back to Spain to take the first position on marine conservation ecology at Spain’s National Council for Scientific Research, and in 2008 he became a Fellow at the National Geographic Society, where he leads the Pristine Seas project. James Cameron, on the other hand, hardly needs an introduction for most Americans. This is the same filmmaker that awed us with Titanic, Avatar, and my-favorite-movie The Abyss. In addition to becoming recently active in advocating the rights of indigenous people involved in energy resource battlegrounds (somewhat stemming from the Avatar project), he has a dedication and passion for technological advances in dive submersibles and in filmmaking about ocean conservation and exploration through his group Earthship Productions. [Additionally,] Cameron has investigated and written a marine forensic paper on the sinking of the German battleship Bismarck, organized expeditions to deep hydrothermal vent sites along the mid-Atlantic Ridge, the East Pacific Rise and the Guaymas Basin in the Sea of Cortez, and led seven deep-ocean expeditions with 72 deep submersible dives. [He] is currently leading a team that is building a unique manned sub capable of diving to the ocean’s greatest depths. Next year he plans to pilot the sub to the ocean’s deepest point in the Pacific’s Mariana Trench, part of a series of dives to the world’s deepest places — the Mariana, Kermadec and Tonga trenches. Clearly both of these men have contributed greatly to the field. With this new support from NGS these newly-minted Explorers-in-Residence are even better poised to further push the boundaries of what we know, what we love, and how we choose to protect the salty seas. In case you can’t quite make Sala’s webcast later tonight via the Smithsonian Institute, here’s a great glimpse of his extraordinary work last year on the Mission Blue Voyage. Now really, get outside and do something salty!